I didn't realize how many special occasions occurred in May until I worked on our Celebrations book with Janet Wong. Sure, it's the end of the semester and school year (in many places) and the home of Mother's Day and Memorial Day. But it's also National Photo Month, National Bike Month, National Physical Fitness and Sports Month, and the time we celebrate National Pet Week, National Teacher Appreciation Week, Children's Book Week, National Etiquette Week, as well as World Laughter Day, World Red Cross Day, and World Hunger Day (which is close to Red Nose Day also devoted to eliminating hunger). Wow. And of course there are many other occasions, once you start digging. My family teases me that I always find SOMETHING to celebrate! 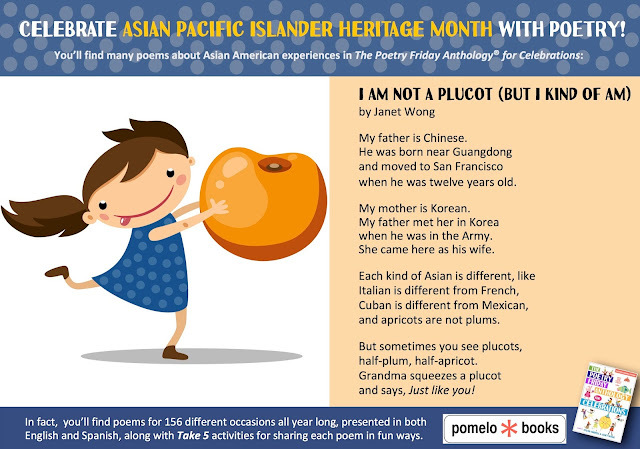 Today I'd like to pause and celebrate Asian American Heritage Month and Asian Pacific Islander Heritage Month-- with a poem of course! I posted this on Facebook and Twitter, so please forgive me if you've been inundated. I love this poem by my pal Janet Wong and what it says about celebrating Asian Americans, as well as our many diverse, blended, and intertwined roots in the U.S. If possible, display a map in the background that features Asia and Pacific Islands while you read the poem aloud, pausing between stanzas. One source is Google.com/Maps/@29,100,3z. Share the poem again with pauses so the children can join in on the key words Chinese, Korean, and plucots while you read the rest of the poem aloud. Talk about how new words are “coined” and how plucot is a combination of plum (plu) and apricot (cot), just as the plucot fruit is a hybrid combination of those two fruits. 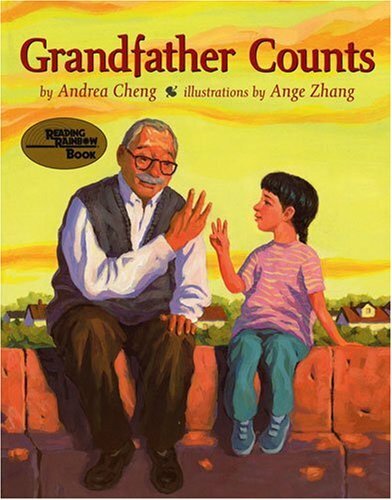 Pair this poem with the picture book Grandfather Counts by Andrea Cheng (Lee & Low, 2000). And for more information about celebrating Asian Pacific Heritage Month, check out the resources at AsianPacificHeritage.gov. For another poem about a family with roots in more than one culture, look for “Our Family” by Kate Coombs (November, page 305) as well as poems in A Suitcase of Seaweed by Janet Wong (McElderry, 1996). Plus, if you'd like even more poetry, here's a list from my book, The Poetry Teacher's Book of Lists. Asian and Asian American poetry for young people is not just haiku; there are many lovely, ancient and contemporary works to share with children. Here is a sampling of poetry for young people by Asian and Asian American poets. Cheng, Andrea. 2005. Shanghai Messenger. New York: Lee & Low. Ho, Minfong. 1996. Maples in the Mist: Poems for Children from the Tang Dynasty. New York: Lothrop, Lee, & Shepard. Issa, Kobayashi. 2007. Today and Today. New York: Scholastic. Izuki, Steven. 1994. Believers in America: Poems about Americans of Asian and Pacific Islander Descent. Chicago, IL: Children’s Press. Lai, Thanhha. 2011. 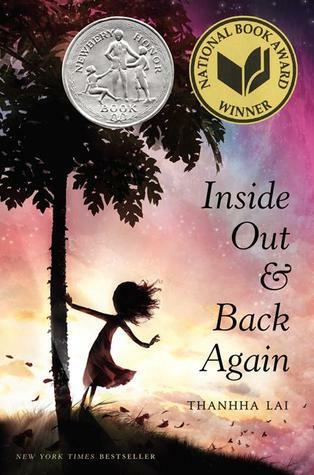 Inside Out and Back Again. New York: HarperCollins. Mak, Kam. 2001. My Chinatown: One Year in Poems. New York: HarperCollins. Park, Linda Sue. 2007. 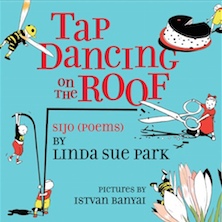 Tap Dancing on the Roof; Sijo Poems. New York : Clarion. Wong, Janet S. 1994. Good Luck Gold and Other Poems. New York: McElderry. Wong, Janet S. 1996/2008. 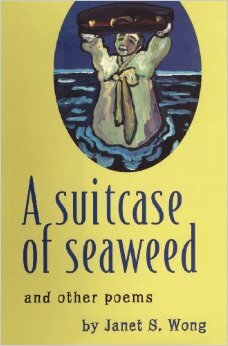 A Suitcase of Seaweed, and Other Poems. New York: Booksurge. Wong, Janet S. 1999. Behind the Wheel: Poems about Driving. New York: McElderry. Wong, Janet S. 1999. The Rainbow Hand: Poems about Mothers and Children. New York: McElderry. Wong, Janet S. 2000. Night Garden: Poems from the World of Dreams. New York: McElderry. Wong, Janet S. 2003. Knock on Wood: Poems about Superstitions. New York: McElderry. Wong, Janet S. 2003. Minn and Jake. New York: Farrar, Straus & Giroux. Wong, Janet S. 2007. Twist: Yoga Poems. New York: McElderry. Wong, Janet. 2008. Minn and Jake’s Almost Terrible Summer. New York: Farrar, Straus & Giroux. Wong, Janet. 2011. Once Upon A Tiger; New Beginnings for Endangered Animals. OnceUponaTiger.com. Wong, Janet. 2012. Declaration of Interdependence: Poems for an Election Year. PoetrySuitcase. Wong, Joyce Lee. 2006. Seeing Emily. New York: Abrams. Yep, Laurence, ed. 1993. American Dragons: Twenty-five Asian American Voices. New York: HarperCollins. Yu, Chin. 2005. Little Green; Growing Up During the Chinese Cultural Revolution. New York: Simon & Schuster. Now don't miss the rest of the Poetry Friday posts that Margaret is gathering over at Reflections on the Teche. See you there! It's no secret, I'm a big fan of Carole Boston Weatherford! She beautiful melds nonfiction and poetry in book after book after book, in addition to many collections of "just" poetry. Previously, I featured an excerpt from her poem, "I am the Bridge," in honor of President Obama's first inauguration here, plus an interview with her about her award winning book, Birmingham, 1963, on the 50th anniversary of the bombing in Birmingham here, as well as many other posts that reference her appearances at the ALA Poetry Blast, TLA Poetry Round Up, and her many other awards and honors. Plus, you can find Carole's "Poet to Poet" interview with Jacqueline Woodson about her National Book Award-winning, Brown Girl Dreaming here. 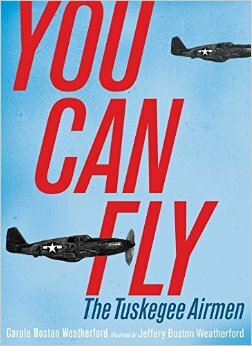 Now, I am honored to participate in a blog tour featuring her new nonfiction book in verse, You Can Fly: The Tuskegee Airmen (Simon & Schuster, 2016), which pairs her poems with the scratchboard illustrations created by her son, Jeffery Weatherford, their first collaboration as mother and son. 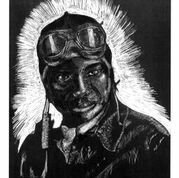 It celebrates "the story of the Tuskegee Airmen, pioneering African American pilots who triumphed in the skies and past the color barrier." Carole and Jeffery were kind enough to agree to an interview-- asking each other questions about their collaboration. JEFFERY: Why did you want to write this book? CAROLE: My parents came of age in the 1940s, so I am nostalgic about that era. My father fought in WWII. The Tuskegee Airmen’s saga resonated with me. It is stirring—historically, politically and emotionally. 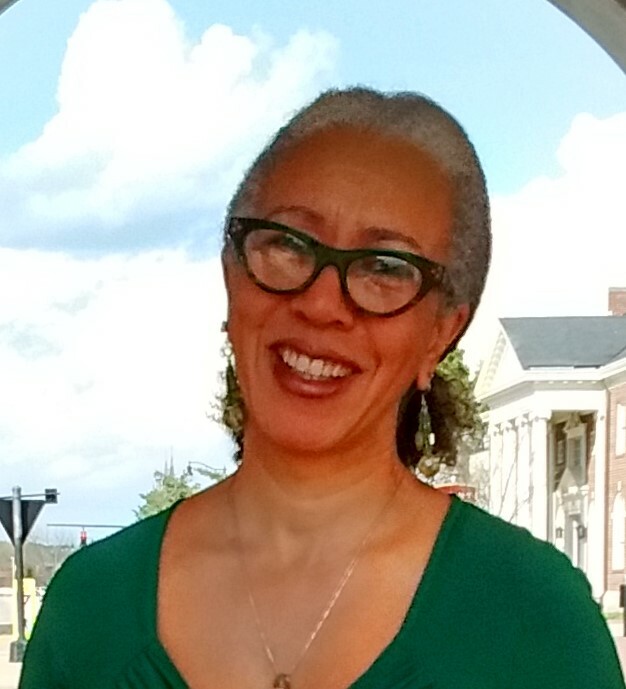 As a children’s literature professor, I knew of an historical fiction picture book and of several informational books about the Tuskegee Airmen. I thought the narrative would work as a sequence of poems. CAROLE: What was your inspiration for the illustrations? JEFFERY: My inspiration was documentary photographs from the Library of Congress. While researching picture references, I had some dreams of meeting Tuskegee Airmen. I also watched the movie Red Tails. JEFFERY: The text is in second person. Whose voice is the narrator’s? CAROLE: I’m not sure. I may have channeled First Lady Eleanor Roosevelt or abolitionist Frederick Douglass. After completing and titling You Can Fly, I was doing picture research and found an account of Mrs. Roosevelt’s flight with Tuskegee instructor Chief Anderson. Afterwards, the First Lady said, “You can fly.” Much later, I read Frederick Douglass’s Civil War editorial calling for African Americans to join the U.S. Colored Troops to end slavery. He urged black men to “fly to arms.” You can’t make this stuff up. CAROLE: What is your favorite poem from the book? JEFFERY: The first poem, “Head to the Clouds,” is my favorite. Another favorite is "The Fight Song." It is the actual fight song of the 99th Fighter Squadron. JEFFERY: What is your favorite illustration from the book? CAROLE: I can’t choose just one. 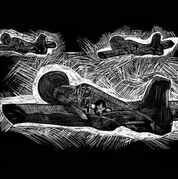 I have three favorites: the portrait of an Airman, the picture of three planes and the picture of the boy who is lying in the grass and gazing at the sky. The Airman looks heroic, the picture of the boy resembles an etching, and the planes are straight out of a comic book. CAROLE: How did you come to illustrate children's books? 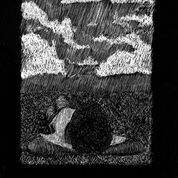 JEFFERY: For my senior project in high school, I illustrated one of my mother’s manuscripts entitled Which Way to Dreamland? It’s based on a question that I once asked: How do dreams get in your head? After college graduation, my mom asked me to create some art samples for her manuscript You Can Fly. JEFFERY: Share something about your experiences with planes or flying. CAROLE: I loved planes as a girl. On Sundays, my family went to Baltimore’s Friendship Airport to watch planes take off and land. That was long before I ever boarded a plane. WWII by the numbers: Of nearly 1,000 Tuskegee pilots, half went overseas and fewer than 10 were captured or killed. Tuskegee Airman Edward Gleed at air base in Italy. Check out the comprehensive review at "The Children's War: A Guide to Books for Young Readers About World War II" available here. Do not miss this powerful book of 33 poems and lots of heart and history, already getting starred reviews from Publishers Weekly ("wields the power of poetry to tell a gripping historical story") and Kirkus ("A masterful, inspiring evocation of an era"). 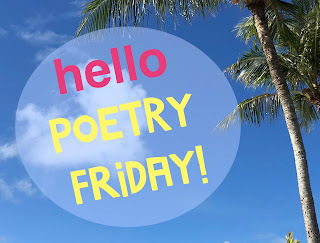 Now head on over to Violet Nesdoly's place for more Poetry Friday news. 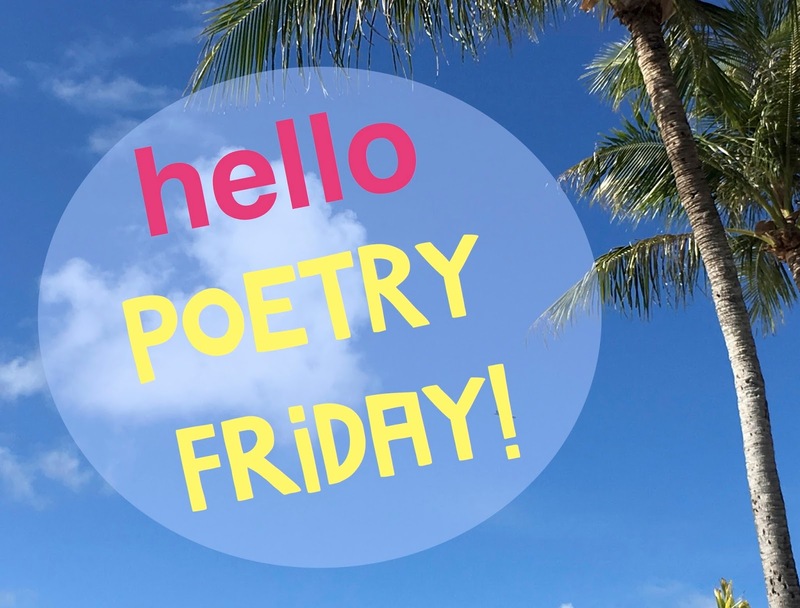 TGIPF: Thank Goodness It's Poetry Friday! 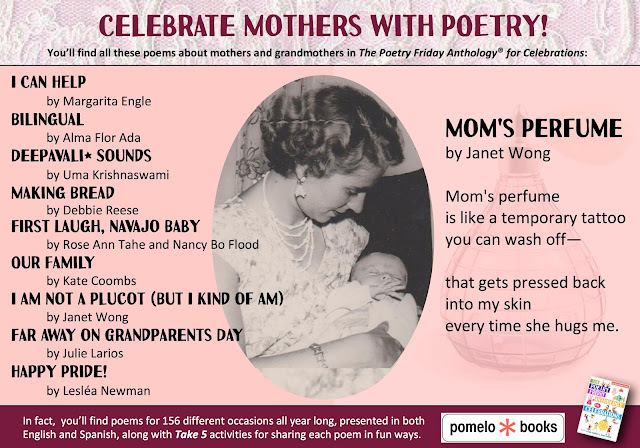 What better tribute for a mother, aunt or grandmother than a well-chosen poem? Poets have given us words with which to honor the women in our lives in many poetry books in picture book form or in novels in verse or in anthologies of poems by many poets. Lewis, J. Patrick. 2005. Vherses: A Celebration of Outstanding Women. Mankato, MN: Creative Editions. McCall, Guadalupe Garcia. 2011. Under the Mesquite. New York: Lee & Low. Mora, Pat. 2001. Ed. Love to Mamá: a Tribute to Mothers. New York: Lee & Low Books. Smith, Hope Anita. 2009. Mother: Poems. New York: Henry Holt. Thomas, Joyce Carol. 2001. A Mother’s Love: Poems for us to Share. New York: Joanna Cotler. Wong. Janet S. 1999. The Rainbow Hand: Poems about Mothers and Children. New York: McElderry. Yolen, Jane and Heidi E.Y. Stemple. 2001. Dear Mother, Dear Daughter: Poems for Young People. Honesdale, PA: Wordsong/Boyds. Now, let's see what poetry goodness awaits us at other lovely blogs! Mister Linky will gather all our posts below. Thanks for sharing!